It is often assumed that traditional banks are cheaper, more transparent and better for people than money service businesses – payday lenders, check cashers and so on. A university of Pennsylvania professor, Lisa Servon recently came to the conclusion that this may be the assumption of the financial elite and that in fact those using the services of alternate finance providers have done their homework and are selecting cheaper, more transparent and better services that the traditional banks can and do provide. Servon did her research the hard, old school, way by getting a job as a teller at a check cashing store in South Bronx and then as a teller and loan collector at a pay day loan store in Oakland. The payday loan industry grew from a $10bn industry in 2002 to a $30bn industry in 2012 and there are now more payday loan stores in America than there are Starbucks. That’s a lot of activity and a lot of growth. Its no longer just low income folk using these services. Declining wages and a doubling of income volatility means that more of the middle class are becoming customers of these services and leaving the banks. Half of America is struggling. Washington-based non-profit, the Economic Innovation Group (EIG), adds some startling new detail and localised specificity to the widening and persistent gap between the country’s rich and poor, the worst of any “advanced” economy. 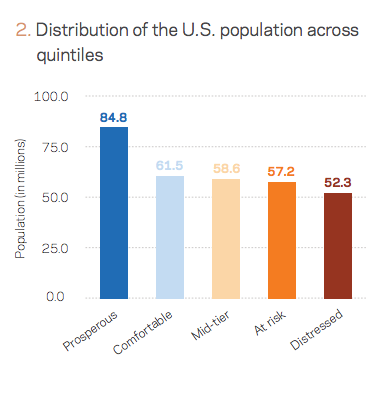 More than 100 million Americans live in deeply disadvantaged, distressed or at risk neighbourhoods. As people are becoming more fragile, the traditional providers are moving away from the lower end and the public sector is less able to support them. This sector requires help. Help that Fintech bank is establishing itself to provide. This entry was posted in Money Service Businesses, unbanked and tagged MSBs. Bookmark the permalink.